Not sure how sharp, to be honest. My trip starts with a very boring flight (cheap air ticket as usual) to Auckland. At least I am on the North Island of NZ this visit. Last time (some of you may recall) I planned a visit for architectural delights, but mis-remembering the info in my brain, took myself via Christchurch to Dunedin (on the South Island). Dunedin, to be sure, is quaint enough, with lots of decent Edwardian/Victorian architecture that would not disgrace Edinburgh or the city of London, but I wanted art-deco. And was therefore disappointed. More certain geographically this time, I headed into Auckland City which, to my surprise, reminded me quite a lot of San Francisco! Similarly hilly terrain (very); lots of nice villagey neighbourhoods. Alas, no cable cars but a very efficient system of inner-city-circle buses in various colours. 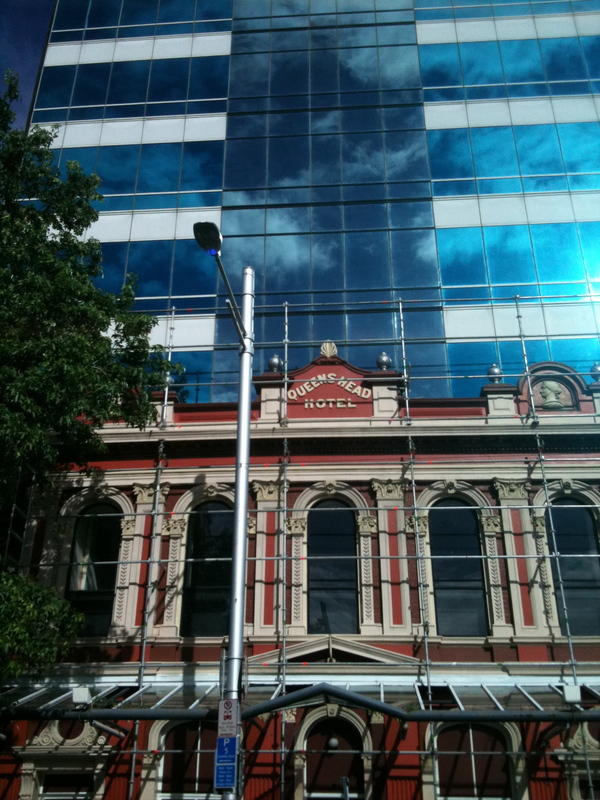 Anyway – whilst I was speaking with my sister Jean about this trip, she remembered to ask if I have seen Baldwin Street whilst I was in Dunedin and I had to confess that it had completely slipped my mind. Ah, such is age…….shall I go back to check it out? Probably not – life is too short for two visits to Dundedin. 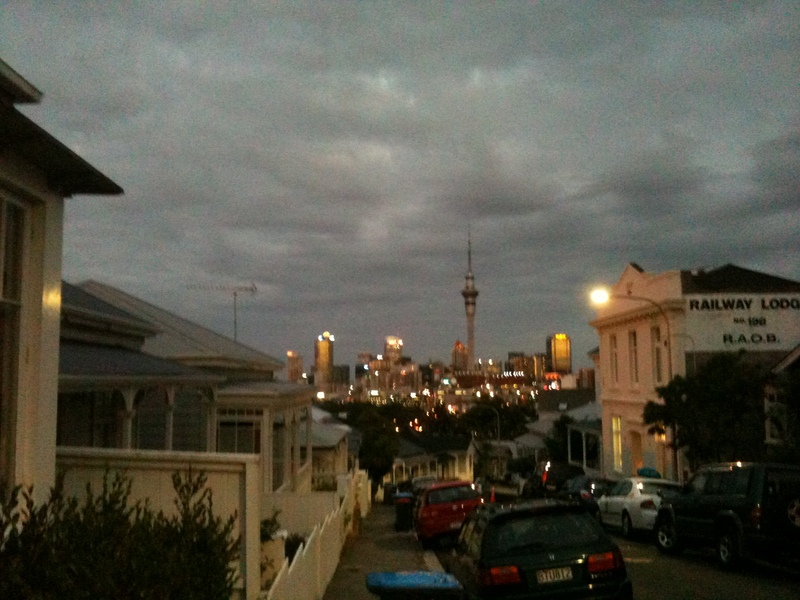 By chance and – I suspect – because of its silly name, I booked into a B&B in a suburb of Auckland : Ponsonby . Turned out to be the little Chelsea area, with boutiques, designer shops and cafes etc. I lucked out (as my San Franciscan friend Miss Purple, would say). Which really means, incidentally, “lucked in”, as it is a good thing, not a bad. Coincidence One. Though the B&B was not good, but that’s another story. 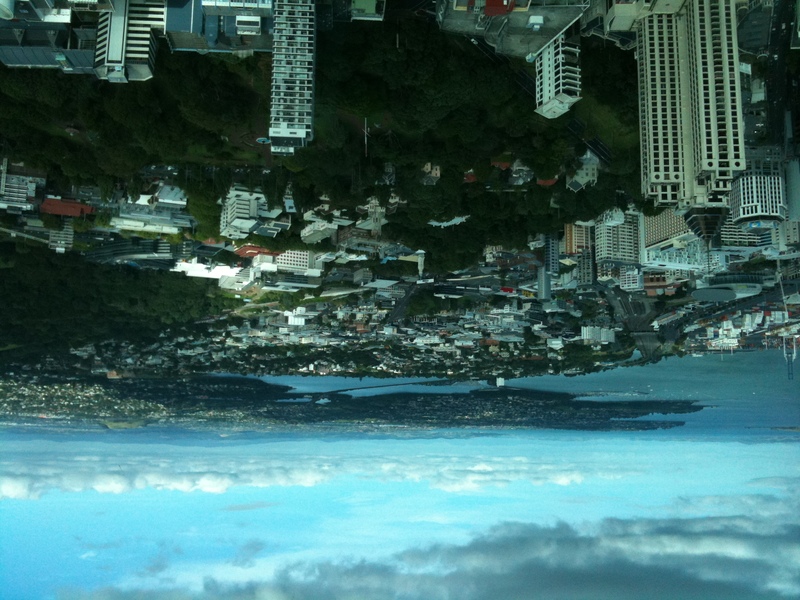 Auckland has a city population of around 450,000 – the metro area in total is in the region of 1,300,000 and indeed, 30% of the population of NZ lives around here. So no surprise to find it is a bustling and lively city. Reminiscent too, if you haven’t been to San Fran, perhaps of Seattle. Young and studenty. I am NZ (as much as for any other reason) to renew my Australian Visa. My initial year Jan 2010 to Jan 2011 will run out on Jan 28th so I am making this trip in order to claim one final 6 month entry before that day, which will allow me to stay till July. As this little trip unfolded, I became convinced that my guiding star was setting the scenario with great flair. Coincidence Two: I need to get an early (7am) bus for Napier – seven hours away. A bus runs from the end of my B&B street to connect with that service. I had planned none of these connections before travelling. There was more to come. 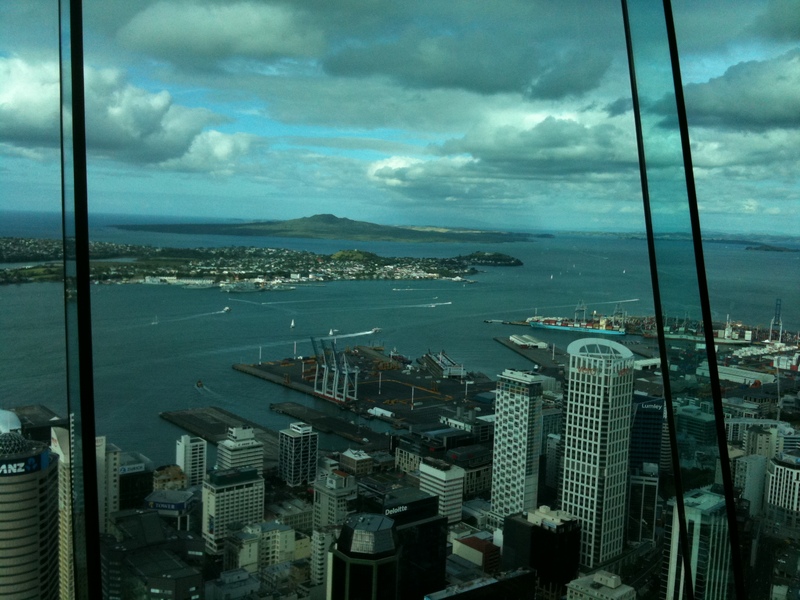 Since I was leaving early, I left my major sightseeing in Auckland till my return a few days later, but in terms of this post I will add them here. 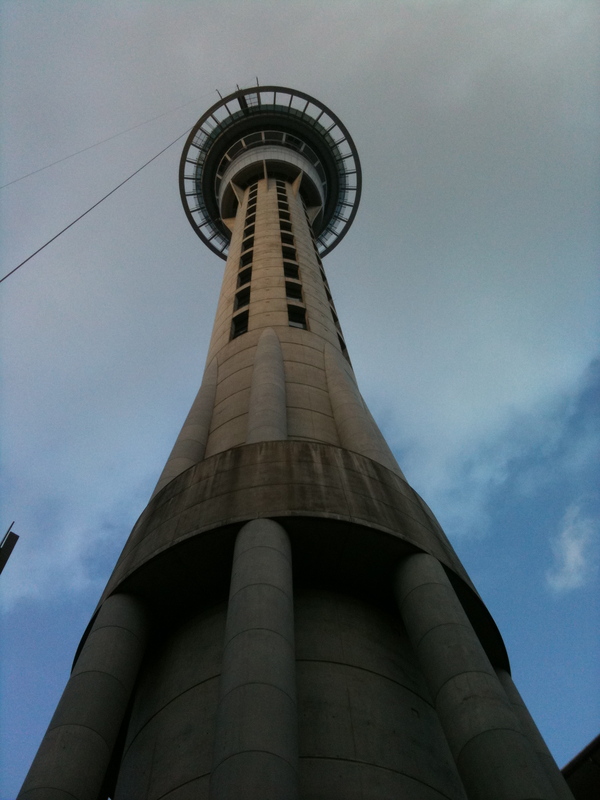 A few shots from the sky tower you see in the picture above and random images from Auckland. Apart from being hillier, this map shows a striking resemblance to the layout of the city of Sydney! All roads lead down to the harbour – facing north; large par/gardens to the right side, freeways to the left…. This is One Building: the brick front is simple a facade attached to glass and the glass tower continues the building upward. I am saying nothing – it’s all in the mind!! You can ascend to various observation decks and cafes – you can even (not that I was game enough) attach yourself with a rope and clip and walk around ‘outside’ at the top! Heavens above – and what a drop below!! 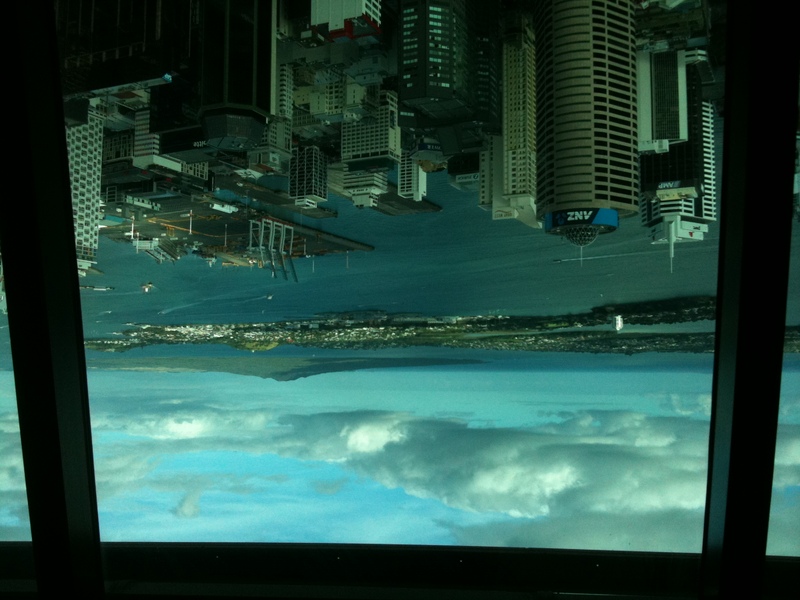 So that’s Auckland from the air……. And so – to Napier. Another of my bus specials; it actually took from 7am to 3pm with a lunch stop and several other stops and plenty of Lord of the Rings landscapes, which I won’t bore you with. NAPIER: lies on the south east coast of the North Island and with its sister city, Hasting is sometimes jointly known as the Bay Cities. Captain Cook charted the site in the 1760s but it wasn’t till 1850 or so that European settlers obtained the land from the local Maori tribe and started building. At that time it was little more than a swampy bay inlet with land on both sides and a lake behind. Nature giveth and she taketh away!! In 1931 a severe earthquake more or less demolished the entire town centre (swampy foundations couldn’t take it, though more damage was done b y the fires that also broke out from fractured gas mains etc). Though 250+ people died, the city gained an extra 4000 hectares of land that, until the earthquake had been undersea! But – with a speed and commitment you cannot help but admire, the bulk of the town was rebuilt in two years. Given the time – and the architectural influences (coming via Australia from America) of Frank Lloyd Wright and others, it isn’t so surprising that most of the rebuild is in Art Deco style. There were a couple of very far-sighted local men too, who interpreted the styles in overseeing much of the rebuilding. What is remarkable today is how much of it still survives. Most of the buildings are simply two stories high and have every type of Deco embellishment imaginable, from Egyptian to Ocean Liner, from Greek motifs to Maori and to wander around the half dozen streets that make up the city centre, is a real treat. It is more fun in daytime that at night for – whilst there is less traffic and noise in the evening, many of the buildings have internal details which you cannot get at after the businesses close for the day. WARNING: This is the point where you close down if you can’t be enthused by a row of art deco! Having said that : this building is anything BUT Art Deco! The only town centre survivor of the earthquake/fire, the Public records office has a grandeur that belies the fact it is actually quite small. (compare the cars parked alongside to see that it is quite tiny). But perfect as a Greek temple on the Acropolis (almost!). It is now empty downstairs and has a gym upstairs. Only 3 of these street markers survive; built into the pavements at a corner. There were at the time no lamp-posts or other street furniture from which to hang a sign and anyway, it’s easier to look down!! Though you miss a lot if you do: my travel tip is always to look up (above the shopfronts) : that’s where architecture often surprises. Some lovely lion head details and lettering. Almost all buildings had the same sort of overhang – to protect pedestrians from rain and/or sun – but ALL also had to have the securing rods above to for extra safety against earthquake vibration! Probably the swankiest building – HQ of the Daily Telegraph newspaper. Munster is a province of Ireland. Check out the little shamrock motif. Some lovely black and white detailing here…. This was my favourite : neglected and lost in a corner away from the Centre. One-time Servicemens’ Club, then back-packer hostel. Now empty and dusty – but for my money, echoes the landmark buildings of people like Frank Lloyd Wright and Corbusier in a gentle and imaginative way. Still remarkably intact – I hope someone gets it and looks after it. Maybe we should all have a whip-round and I will reopen it as a chic boutique hotel….. Napier could use one. Coincidence Three: without my asking, they had allocated me a room right on the Terrace, overlooking the street : the best view and, as it turned out, the last room available there. Thanks Guardian Angel! Rebuilt after the earthquake – the Masonic is now in its 3rd incarnation – today complete with roof level terraces overlooking the beach and promenade. Once a year they host the focal point of a city-wide Art Deco week where you can’t move for Gatsby lookalikes, their molls and the motors!! 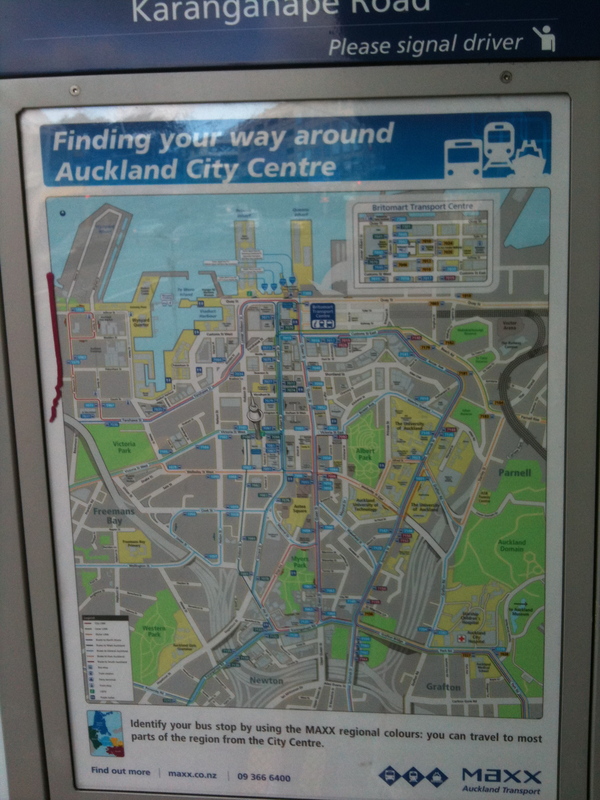 And so – after a few days wandering and wondering, I returned to Auckland and thence to the airport. Somewhat trepidatious, I was expecting a grilling at immigration. Guardian Angel had other plans. Coincidence Four. I was flying with LAN Chile – no I had never heard of them either! But, as it turns out, they are the national airline of said country and as it also happens, they had a promotional deal which meant that for the same price as a real budget airline, I got a proper economy ticket to and from Auckland. LAN Chile flies Santiago de Chile to Auckland to Sydney and back again. Who knows why? Trying to check in online didn’t work (it couldn’t find my booking!) but I managed OK at the airport and then waited; it was a 6am flight. I arrived far too early and was dozing by the Gate when they called me by name over the tannoy to come to the desk where the attendant asked for my Boarding Card and promptly tore it up! I thought to myself: this is either very bad news, or very good news and it became the latter when she handed me a new Boarding Card saying with a smile, “we’ve upgraded you, Mr C – have a nice day”. Feigning nonchalance, I pocketed the Card till I got around the corner and took a look at it. Seat 2A. Thank you LAN Chile! You can’t get any nearer the front. Premium Business Class came with all the extras you would expect; my only regret was that I was taking only a 3 hour flight to Sydney – I would have liked to try the full flat bed on a longer journey (say to Santiago) but I gave it a trial run anyway. My fellow Premium Class passengers probably wondered what was wrong with me as I went horizontal and back several times. Coincidence 5 now under way, upon disembarking at Sydney, a very nice Qantas ground handler gave me an Express Ticket for both Immigration and Customs/Quarantine. Suffice to say that, whereas the majority of passengers were forming orderly queues for entry to Australia, your’s truly whooshed through an empty express lane and arrived at the Immigration Desk. and I am through and in the Arrivals Hall. Total time from landing 30 minutes – including picking up my case. from the carousel. As I said, my guardian angel / call it guiding star was on my side that trip. Oh, there was the one other (little) adventure I almost forgot to add. What does New Zealand say to you? Rugby, Maori warriors (Haka), Cricket, Arms covered in tattoos, Lord of the Rings, local culture and icons, Cheese, Lamb???? Anyway – more than anything I always remember those almost Celtic tattoos everyone seems to have – well everyone under 30 anyway. So who says an over 60 can’t? Which is, as can be clearly seen, one of the local transport providers!! There is (I know) no fool like an old fool and I stand here before you, thus self-proclaimed. Did it hurt? Yes, a bit. Like that bit when the dentist first puts the numbing needle in – only this took a while longer than a micro-second. I didn’t know what to expect either; bit like a visit to a new dentist in that respect also! 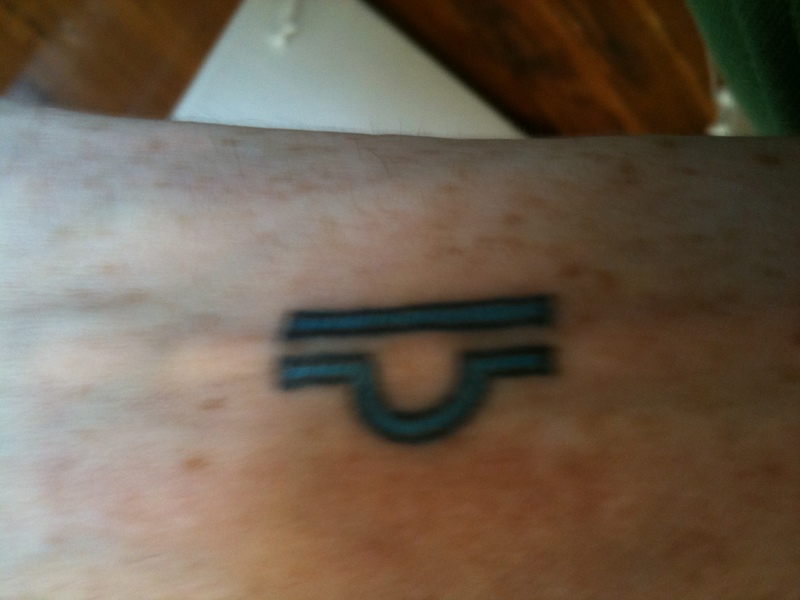 I just hoped it wouldn’t hurt so much that I would sob or groan, since the Tattoo place operatives were all very macho. As it happened, I gritted my teeth and thought of England – or something. I was more concerned about keeping my arm flat and straight (!) so the hand-drawn image wouldn’t be crooked. Which it is a little, anyway, but that doesn’t matter a jot. After it was done, it was wrapped in cling film for the day and though I kept close watch on it, nothing happened : it got a little crusty a week later and after 10 days or so, is all quite ordinary. So my first (and last!) tattoo or self-organised mutilation! I started this post with a pun about Rapiers in Napier and , as it turned out, finished there with an even sharper tattooist’s needle! Whatever next…………………… pray for me! This entry was posted in Architecture, Art Deco, Astrology, Australia, Coincidence / Higher Power, Islands, New Zealnd, Outback & Bush, Tattoos, Travel. Bookmark the permalink.